Cheap airfare is really a must for me to get because it’s the only opportunity I could go back home and spend vacation with my family. And I know that many people have the same situation as mine. In this time of economic crisis, spending more than 4000 pesos traveling from Manila to Cebu is a big “No no” for me. 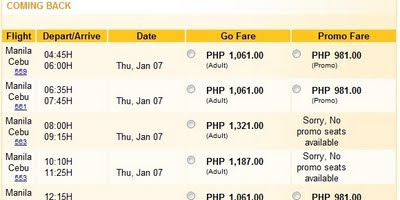 To be able to avail of the cheap airfare though, you have to get the news fast and you have to book your ticket online. I have already written an article on how you could get the news fast. 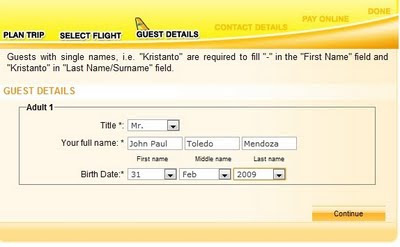 This time, I’m writing a comprehensive step-by step procedure on how you could do online-booking at Cebu Pacific’s official website. This procedure is based on their CURRENT system and may change after sometime. I am hoping that this will help many. 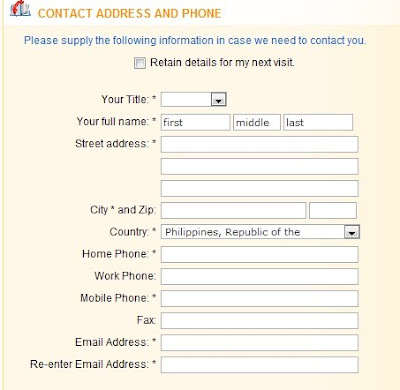 At the homepage of www.cebupacificair.com, you could see this form at the left side of the webpage. Fill up ALL the needed information here. Choose between “round trip and one-way”. Choose the flight date that you want. Check the “Go-lite” box if you are travelling with only hand-carried baggage (no more than 7kg) to reduce your fare by 100 pesos. After filling up the form, click on the “Search Now” button to proceed with the next step. After pressing search, you will be taken to a page where you can choose the time of your flight. 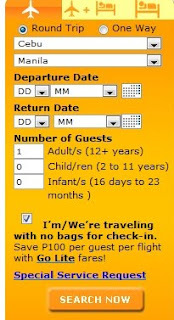 In this form, you could see the prices of different flights. Select your inbound and outbound schedule here that best fit your need and budget. NOTE: If there are promo fares available your chosen date, the “Promo Fare” column contains cheaper fare prices you could select. After selecting the time of your inbound and outbound flights, click the box if you agree to the terms and conditions and proceed to the next step by the pressing “continue” button. The page will ask you to enter the information about the persons that are flying. After filling up the form, press "continue". You will be asked to choose whether you ant to avail an insurance. If you do not want this, just uncheck the box. At the bottom of the same page, you have to fill up the” contact information” form. Those items with asterisk are required before you can proceed to the next step. After filling up this form, you may now proceed to the next step by clicking “Continue”. The page allows you to choose your seat location for a cost. If you do not want this, DO NOT CHECK any of the boxes and click “Continue” to proceed to the payment page. The payment page allows you to choose the method of payment that you want. The current payment options are: CREDIT/DEBIT Cards, Bancnet Online, banco De Oro (BDO), Robinsons Savings Bank (RSB), and Metrobank. If you choose credit/debit cards, you have to fill up the required card holder information. Then you will be taken to the card validation page where you have to supply information to validate your ownership of the card. After completing this, you will be ready for the next step. For those without credit card, you may choose BDO, Metrobank, RSB, and Megalink, then press “Continue” to the next step. For those who paid using Credit/Debit cards, you will be asked to finalize the transaction. If you don’t want to change anything, press the “finalize” button and it will generate the Confirmation number. You can print this page to serve as you ticket. A separate email will also be sent to you and may also serve as your ticket. For those who choose to pay with BDO, RSB, Metrobank, and Megalink, you will be issued a 14-digit confirmation number. List it down and proceed to the payment center before 12 Midnight of the same day. 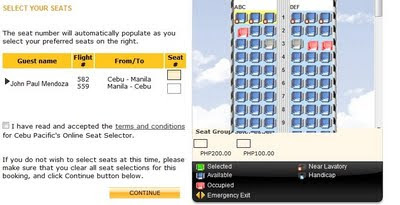 This concludes the procedure of booking online at www.cebupacificair.com. On the next article, I will be posting detailed procedure on how to book online at Philippine Airlines website. can i ask if i could book a ticket using my chinabank atm card?.. and if it is, would you mind tell me on the process?.. hi,can i ask if i could book a ticket using my bdo cash atm card?.. This is a very helpful post. I have no credit card and I don't want to sign up for one. Now, I know I can use my debit card. Thank you so much!